Hovercraftdoggy.com was named after an image that makes us smile and think positive. It is what we call “hovercraftdoggies” [ = little dogs that walk like they are floating on air ]. …this is where I would like to follow you, get to know you, admire you, feel close to you now that you’re away…thanks…. Very clever blog… Thanks for following my blog and bringing me to yours! Thanks for the follow! I stopped by your blog to see what you are all about and I had to laugh out loud when I saw your drawing above. I have a dachshund named William and that is exactly what he looks like when he is walking. ah amazing! :) … please send your best wishes to William! Hey you two… I’ve nominated your blog for a Sunshine Award. You can see the post here… http://designchickee.wordpress.com/2012/04/22/good-morning-sunshine/. You are by no means obligated to participate but I just wanted to let you know that I look forward to your posts and that they bring me sunny warmth every time. Thank you! Hi! Thanks for such a gorgeous selection of photos and for titles that make me smile :)! amazing blog guys! gorgeous pics. keep inspiring us! Thank you for the follow! Hovercraftdoggy looks beautiful, I’ll definitely be back for inspiration. Oh wow..thanks for stopping by and the following. Your welcome and have a happy Friday! Hi, tom kat. I really appreciate the ‘like’ on my ‘fence post’ titled Drive-by: Fabulous Fencing. I took a quick look around your blog and I must say they are off the hook! Our dogs don’t hover the ground but they do practice the same trait in a vulture! I shall return! I love the name of your blog. And thank you for stopping by mine. It’s greatly appreciated. Love the travel pack for the beer! Tom-Kat-thanks for signing up to follow my blog! I hope that I will entertain you with the variety of posts that I do! Thank you so much for following Marti ink! I hope you have a wonderful weekend. Thanks for the follow, I LOVE your pics! A very diverse and interesting collection of pictures you host. Thanks for following my blog, I’ll be keeping up to date with yours. Thank you for dropping by my blog! I love the pictures on your blog – they are awesome! Thank you for following my blog, and i will do the same for you. Best wishes on your blog and your collaboration; I look forward to seeing your work grow together. I did want to thank you for follow me northward and say it is very much appreciated. See you again soon! Thank you for following my blog – the bonus is that I’ve now found yours… thank you once again for your interest! What a treasure trove of beautiful and thought-provoking images! Thank you for following my blog. Your pictures are really good! Thanks for the follow over on my blog; I look forward to delving in to yours. And, it’s so nice to meet you! cheers for following artbibel! i do like your work too! Thank you for following my blog – and this way guiding me to yours! I love your selection of great stuff and will definitely spend some time checking out more of what you do! Great name for a blog – thank you for stopping by and following. Hi! Thanks for stoppingby my blog. I’ve been exploring yours and must say I’m very impressed – I love your photos, and the clever way they tie into post titles! keep up the good work! Thanks for stopping by. Love the simplicity of the words. So glad you found each other! Love your pics! Thank you for following my blog today! I have browsed thru your blog and find it VERY unique. Keep up the great work! may you find your passion and embrace it, and find fufillment in the sharing. Interesting collection of things! I look forward to seeing more. Thanks for visiting my blog. Thanks so much for going ‘Round the bend and liking my photos from the gardens at the Bellagio in Vegas. I love how you found your blog name! I look forward to exploring more. Thanks for stopping by my blog and liking my recent post. The photos you have here are stunning and amazing!! This is one of the best if not the best photography blog on the web. I am impressed and look forward to seeing more. Excellent Work!! Thank you for liking my paintings. You have a very beautiful blog! Some fascinating stuff here – congrats. Thanks for visiting my blog too. Thank you for my like! As a new blogger and amateur photographer, I appreciated it! Thanks for “liking” my blog entry “We interrupt this blog…” on my “arnnarn.com” site. I hope you come back often. I look forward to reading more of yours as well. I’m loving the odd (I use that word positively) design features you find. I love nature photography, and many of the blogs I follow focus on that, but it’s nice to connect with a blogger who has an eye for good art. Your blog is fun. Keep up the great work and thanks for following my blog. Thank you for the like. I’ll check your blog. Amazing photographs! Stunning site. Thanks for stopping by mine so I could find you! Can’t wait to see more. Thanks for the visit. I see we have similar interest. You have color and composition as well. Enjoy and I will follow to see what is new from your part of the world. Wonderful selection of photos. I see some are attributed to their originators. Are some of them yours? Which ones? Much as I love photography I just don’t seem to have ‘the eye’ for a stunning shot, of which there are so many on this blog. Hi Tom Kat — Thanks for visiting my latest post, “Iceland in the Rouge Valley”! Like you, I try to notice funny and strange and beautiful and odd things as I go about my day. I’m having a good time here on your blog — I love what you notice. And your photographs are wonderful. Thank you for stopping by my blog and liking my post on the Isle of Wight! Your blog is very original, thanks for sharing all of the great photos. I love the name as well! Hi guys! Thanks for liking Oido Del Mundo today! You’ve got some brilliant stuff on here. I want one of those tree tents! I have always wanted Futurist dog, and a Chevron, and living in a back water, I understand your plight! Thank you for your ” like”! Thanks for dropping by my blog! I’m very much looking forward to exploring yours. Lovely site, love the inspiration picture ! My sister has a Doxi, hers is a little too rotund to float like that though! Really fantastic collection you have here! Love your style! This blog is composed of lovely things. I love it! Thanks so much for visiting my site and leaving a footprint. Thanks so much for popping in and saying hi. Gracias!! so much for visiting my new blog and for liking my pictures, I am very new at this , and your visit is encouraging! I enjoyed yours and your creativity! Thanks for the like! Please visit again! Hello. Thanks for the visit on my blog. Nice blog you have here. I like your definition of hover craft doggies – like a fluff of fur that walks on air! Wow! I’m really impressed with all these amazing photographs! What a wonderful collection!! Thanks for liking my blog post. All this photography is absolutely amazing! Great collection of the intriguing, amusing, and unusual. Had a blast touring your photo collection! Thanks for the “like” on my blog or I would never have found you! 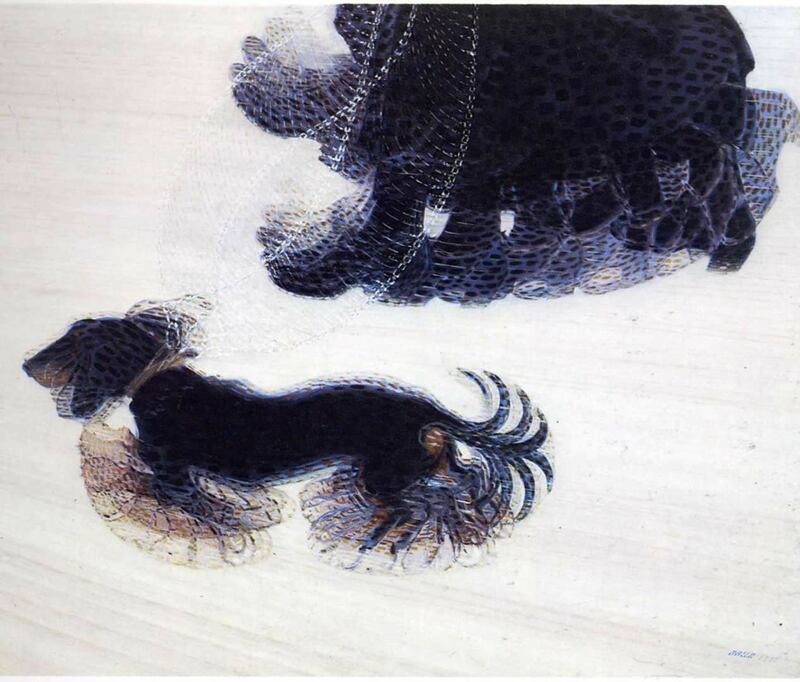 That image by Giacomo Balla has always been a favourite of mine. I love your description! I can’t wait to look around your site, particularly as I have a love of architecture. Thanks for stopping by my own blog. Groetjes! Thank you for visiting my blog. I recently finished a Digital Photography class in college and love to view photographic works by other professional photographers to give me ideas and inspiration. I have an interest in photographing buildings and architecture designs, so this site is right up my alley. I look forward to seeing more of your stunning photos. Thank you for liking my posts. I love your pictures and how unique and beautiful they are! Thans for liking my post. I am also an Athenian:-) and live in the Netherlands. Great work btw.. Thanks for visiting me at jennsmidlifecrisis.wordpress.com. I really, really enjoyed looking through your blog and have told my family & friends about it. Absolutely amazing! Thanks for liking my humble blog at MayfairMum.com – I’m so glad I clicked to find out who you are! I just love so many of your posts. Thank you. I might even have to share you with my readers if that’s ok with you! Thank you for the like……. Hey, are you in Eindhoven? cause i saw something similar to your work around there? ah! I see, anyways thank you for stopping by, I love what you two are doing here… will stay tuned for more. I like the picture you are named after. (I forget the artist’s name.) I think of it as a precursor to those cartoons of my childhood where the characters jump in the air and whiz for a while before running off. That photo of the two dogs moving has always been one of my favorites. Thanks for the like on my post. Your collection is refreshing and interesting. Thanks for liking my post! Come back to The Tenderfoot soon! loved ur blog! wish you trillions of success :D.
Thank you for liking my post “The Fantasy Wonderland”. I had a look at you blog too and it is amazing. I am following you now. All the best!! Great blog and thanks for visiting mine. Thanks for stopping by my blog and linking me to yours. A fantastic place! Thanks for liking my post New York City at Night. Congratulations! you have been nominated for the Very Inspiring Blogger Award. Vist my site and pick up the details, it is well deserved! Thanks for liking my post on Notanda. What a lovely blog you have. I will have to check back here soon. thanks for stopping by turnsofendearment and liking and good to have found your blog! I’ve lived almost 4 years in A’dam but currently lost in an island somewhere in the Aegean . . Thanks for stopping by my electrohome. I dig the artwork here. Thank you so much for liking my recent post. Your blog is amazing. I’m following it because you are both have such a unique perspective. Thank you for following Lorain 365! I’m glad you like what you’ve seen so far :-) I’m enjoying perusing your photos and look forward to seeing more of the beauty in your world! Dynamism of a Dog on a Leash. Such a fun, truthful painting. =) I love your blog’s namesake. I’m also rather fond of the story behind your blog. I have a close friend that I call anytime I want to find something beautiful (we have a knack for this sort of venture). This blog makes me wish my camera wasn’t broken. Lovely work! I’ll be checking back. Thanks for visiting my blog and liking my post about the parakeets and drumsticks. What a beautiful blog. It makes me very happy there is so much architectural beauty in this world. Thank you for connecting with me and sending me to your blog. The photos are amazing and so simply beautiful. Looking forward to seeing much more. Take care. WOW! I am absolutely in love with your blog! Do you have a business website? ..glad to hear you enjoy our posts. We will try to keep inspiring. As a sympathy with you from a distant place ! Thanks for the visit, You are an amazing photographer, I like all your posts, and I’ll be following to get to know you more! Thanks for liking our post! I can hardly wait to see more of what you have to offer in your blog. Awesome photography! Thanks for liking my blog post. Best wishes for continued success with your efforts at bringing beauty to the world. You have a wicked blog :) thanks for liking my entry on Krenzlauer Eck! Just looked at the doxie pic – that’s funny! we have a dachshund, a blue dapple, long-hair, and he walks funny too. And he’s really fast when he’s charging through the house all excited because hubby is home and playing with him. Hi, thanks for looking at my blog about Nicaragua and the beaches there. I love your pictures and the titles. Wow what a blog!!!! I love it, I have gone down the pictures clicking like, like, like! Keep up the great work, I am a follower! What a wonderful blog! So nice to “meet” the two of you and have the pleasure of perusing your site–very much the sort of stuff that floats my boat as well. Looking forward to seeing what comes next! What a fun blog! Enjoyed it! Thanks for visiting mine, too! thanks for liking my rather silly recent photo post! And for bringing me here. Looks like I will have a great time exploring! Thanks for liking my post Stonehenge. Thanks for the like – and for allowing me to discover your blog. These are wonderful photographs and I like your whimsical titles! I hope to see more. Awesome pics! Thanks for swinging by my “place”! Thank you for visiting my blog. Love what I’m seeing here! That dachshund painting has been a favorite for years! Thanks for liking my post today! Your blog is gorgeous! Thanks for liking my post! You’ve got some gorgeous pictures here! That futurist image is one of my favorite paintings ever. I’m now sufficiently intrigued by your blog and will definitely back to fossick around in the near future! Hey there! Thanks for dropping by my blog, i certainly appreciate what you guys are up too. All things beautiful… Ill be keeping an eye out! Thanks for liking my “Oil is strong…” post on “arnnarn.com.” Keep up your good work. We think you’re just so rad. Thanks for liking my Monet Gardens post! Spectacular site! Thanks so much for stopping by my blog and liking my recent post about BlogHer. Glad to have discovered you. Love your blog. Thanks for following mine. Thank you for stopping by my recent post. I love the story behind your name :), as well as the photos and ideas here. So creative! It’s just wonderful to see what other folks see through their lens and words! Thank you for liking my post. I love the ‘hovercraftdoggy’! I never heard that before but it’s perfect! You have a beautiful blog. Some amazing images. Love, the quick, inspirational photo blog! Thank you for visiting my little garden blog! thanks for the like all the way from the other side of the world. Thanks for checking out my blog! It takes alot to click the like buttone especially when you don’t know the person from a bar of Soap(mouth)! haha. all the best! Thanks so much for liking my posts from family portraits we’ve taken. I love the collection of photos that you have created and look forward to seeing more. You guys have so many inspiring pictures!!!! Thank you so much for sharing… I like your “eye”!!!! Also, thanks for stopping by my blog, I hope you’ll be back. It gave me a chance to discover yours. thanks for checking out my blog. I love your blog name, and the picture! My aspiration is to one day have a little dachshund buddy. TIll then, I can enjoy at yours! You have a beautiful site here. Very interesting. Your blog is beautiful! Thanks for stopping by mine. I like the blog! Simple words, brilliant photos that go along. Thanks for dropping by writingwindow, too. I particularly like your titles. I’ll be meditating on these pictures. Your selections and posts are fabulous and I look forward to seeing more. Thank you! Wow, let me add my amazement at your wonderful blog to all of the others above. Awesome pics! Thanks for stopping by, I’ll be following in future. Thanks so much for stopping by our blog, visiting our “Kitchen” and liking our post. We appreciate and love visitors!! Thank you for swinging by and liking my post. Nice to have you there. Wow! thanks for stopping by The Orange Bee as it led me to your engaging blog. Love the photos! I”ll be back regularly…nice to meet you. I think your pictures are hilarious! They’re wonderful pictures just by them self, but the titles make them even better. Aww, that picture of the hover craft doggy makes me smile! Loving the collection of images on your blog! Wow, cool…thanks for checking out Water for the soul…I’ll be back to see more of your images. Thanks for visiting MoE’s art. Appreciated. Thanks for visiting my blog and liked it…I like your photos and designs, love to enter photography too…soon i make one! You inspire me too…keep it up! What a terrific site! I will enjoy visiting here, thank you! Thanks for dropping by my blog and leaving a footprint :-) I’m really happy you did so I could find your blog. Loving it! Great collection of photos and look forward to seeing more. Hi, i like many of the stuff you post, but wonder why you are not giving credit to the artists/designers/photographers etc. from whom you got the images? It would be the decent thing to do and it would help me to find out more about stuff I see here and like. I love the name of your blog. Makes people want to check you out. Brilliant! Hi – I just wanted to let you know that I’ve nominated you for A Very Inspiring Blogger Award (the details are on my blog). The photos that you post are amazing and I always enjoy stopping by to take a look! I enjoy your blog so I’ve nominated you for The Versatile Blog Award! Visit my recent post for the rules to play along, and accept! Such neat pictures! Thanks for liking my post! Thanks for liking my lastest post ! WOW ! FABULOUS BLOG !!!!!! The image of a lighter than air, happy pup makes me smile. Thanks for visiting my blog and the kind “like” of a recent post. A love story between 2 architects! I can very much relate! :) Love the photos on your blog. It’s a good source of inspiration when starting the day (or a new project!!!) so I subscribed. Cheers! Thank you so much for liking my post on the Postcard Lemons cushion – much appreciated. I’m now going to enjoy looking round your blog as architecture fascinates me! Thanks for checking out rickharper.org. Love your site! Thank you so much for the likes! I really love what you do and I am happy you’ve stopped by my blog. Please, feel free to share your thoughts, I’d really appreciate that :). Thanks for liking my post Photographer Self-Portrait . Interesting blog concept, well done to you both and thanks for following me. Veery interesting concept, I look forward to seeing what you post. Thanks for stopping by. Great blog! Thanks for liking my post today. I love your blog. I can and will probably look again and again. Thanks for liking my post so I could find you! Cool! I have a different blog that you originally saw my post on. I didn’t realize my comment on here would link back to my primary blog. Here is the other address, in case you were wondering! http://sacredbeautiful.wordpress.com/ Oh, I just figured out how to update the details for this reply. Let’s see if that works! Thanks for liking my post Feathered Friday and for sharing these amazing images and your amazing descriptions on this blog. It has a unique voice and tells an invigorating story. Well done! Thank you for dropping by my blog. Verry happy to meet yours: it’s absolute magic. Sorry, previous comment signed under wrong blog… the magic in the eyes and and still is for Rosie and Feralbulb. l’ve always loved that painting.. cool blog too! Every good blog has a story behind its name (and you’ve got a very unique name to boot!). You’ve grasped the story behind yours, and sprinkled in a bit of magic in your description, and I commend you for that. Hello. Such a lovely blog! Thanks for stopping by my blog and liking my post. I hope our paths cross again! Thanks for stopping by my blog. Your site is full of interesting creative work. I look forward to returning here in the future. thanks for stopping on my blog!! I love the pictures, the little i’ve seen through perusing through your blog. Thanks for stopping by my blog. Looking forward to seeing more of your posts and pictures. Amazing images that start a thought process in one’s mind, thanks for directing me to your blog. Hey there…thanks for stopping by and checking things out…have a great day! Thanks for liking the “Now where’s that photo…” post on my arnnarn.com blog. It’s good to hear from you again. Thankyou for checking into my blog, I hope you like what you find there. This site is awesome, I love archetecture and to see your eye for detail and the beauty of design and build is wonderful. Beautiful photography, inspiring and cheerful. Thanks for visiting Pirates & Pulsars. Great images here at hovercraftdoggy. Will come back soon. Love the beautiful, clean look of your blog! I look forward to following! Thanks so much for stopping by my blog and liking a recent post! From Japan. Thank you for visiting my blog. I enjoyed your blog’s phot.. Your blog made me smile. I will be checking back often. Good luck with your architecture; please make it beautiful! what an inspiration! love you blog… and thanks for the like on my recent post. All your photos are amazing and hence an inspiration to me. Thanks for visiting my blog. Thank you for the visit to LightWriters (5wise.wordpress.com) and for introducing me to your amazing blog expressionism in photos. Awesome! Blessings, S.
thanks for the like – glad it brought me over your way! What an inspiring blog! Love it! Thanks for checking out my poetry blog and for the like! Thanks for popping by and liking a post – love your blog! Love this! My dog, Bellamy, prances like she is stepping on clouds. My other dog, T.Bear, lumbers about like Ferdinand the Bull from the old Warner Brothers cartoons. Keep showing magic! I’m so glad you came to my blog so I could in turn discover you. What great photos in such a clean presentation! Thanks for coming back. I’m so loving your posts. Thank you for stopping by my blog! I love the variety of pics you guys post. My dog, Abbey, is a corgi/lab mix with stubby legs that she moves at incredible speeds. She could easily be a hovercraftdoggy. THANKS for visiting my “pun-ny” photoblog and leaving a “like.” Your photos and titles have ensnared me, so I just subscribed! Hi! :) I nominated you for the Reader Appreciation Award, check it out here:- http://momentsnotmemories.wordpress.com/2012/07/16/reader-appreciation-award-ta/ :D love the blog. You have been nominated for an award! The simple reason I’ve been following this blog, is because you stumbled onto my blog, and liked a single post. I really appreciate that. Looking at this blog, I’m mesmerized each time by your vibrant and enthralling architecture and idiosyncratic snapshots of life. I have two things I would like to ask you. – Firstly would you mind if I included this blog into my blogroll and shared more of it with other bloggers out there? – Secondly, I’m interested in the share button you have at the bottom of each post. Is it part of a theme or is it a piece of code (or perhaps a widget or sorts) I could add into my own blog? This website is what blogging should REALLY be about! ..the share buttons are part of wordpress, so in your dashboard, under “settings/sharing” you will find the option to add these sharing buttons to any of your posts. No worries if you’re not into awards. Just a nod to let you know I think you’re doing a great job here! I nominated you for the Versatile Blogger Award! Here’s their website for more information and their logo: http://versatilebloggeraward.wordpress.com/about/. Great blog! I’m glad I happened to stumble upon it. Will definitely come back many times. You’re blog is so COOL :)! Thanks for the like on my post, and I love love your scotty dog logo! I was once owned by one of those little guys! Beauty is Truth. Truth, Beauty. That is all ye know on Earth and all ye need to know. John Keats. Thanks for stopping by my recent post. Going to check out your site. Thanks for stopping by and liking one of my photo post. Best wishes on your blogging as well! Fantastic blog! Wow, inspiring! Will definitely come back. Thanks for the like on my photo post. Thanks for the like and visit to my blog – amazing images on here and will return. You are a lovely find, thank you for visiting me. My blogging was to force me to focus on the good in my life not really to build a profile or even connect, but am loving finding beautiful blogs like yours. So thanks. Thanks for Liking my post and bringing me to your blog. Your blog looks amazing. Thanks for the visit guys. Hope to see you soon, on a flight perhaps??? Telma Cortez. Thank you for liking my post and helping me to find your blog, it is simply gorgeous. I will be following and admiring the amazing photography. Thank you so much for stopping by my blog and liking the Mayfair Tram. I think your pictures are simply AWESOME. Hi there, thanks for the “like” I’m honored to be included in this blog. It is super inspiring. You have a very nice eye and well curated works. Best! Thank you… It s our honour that you stopped by our blog !! Awesome blog! Love the photos, will continue to check them out. Thanks for the like on my post “film”. Your blog is glorious!! I look forward to further exploring it! Thanks for your visit and like! Your photos are amazing. I will follow on FB. Thanks for stopping by my blog. I love yours! So creative! So much fun! Thanks for stipping by http://www.bitsandpiecesonphoto.com. love the collection of photos here. so quirky and refreshing! I’ve nominated you for the One Lovely Blogger Award, see the link on my blog http://wp.me/p2DnTA-a9 Good Luck!!! love love LOVE your blog. do you take any of the pictures yourself? Love love love love it! Magical and fun! Thanks for this morning’s smile! Some stunning collection of photos and they are absolutely different from regular photos. Yay! Thanks for visiting my blog and so happy i visited and “found” you!!! I’ll be baaaack! Just reblogged one of your photos, I may be tagging you a lot… fodder for the eyes. Thanks! Thank you for liking my post today. You found me and I just found you! Will become a follower! Have a beautiful day! Thank you for liking my post today. In turn, I found this amazing and inspiring photography. Brilliant images! Thank you for sharing! hey guys! thank for swinging by my blog, i just started it a week ago! super eye you got for beautiful things! am following already! Thank You for visiting! You have an amazing blog! I love the name of your website. I was sure you were from Florida in the US with the reference of hovercraft! I was so wrong! I was an architecture student at Virginia Tech in the USA a million years ago, but, alas, transferred to an English major. Thanks for reading and responding so nicely to Soliloquy. I’ve acted in a lot of community plays, and realized the transition that occurs over “ownership” of the words of a playwrite from the author to the actor. Thank you for the like and support! Love your blog! I also hope to create my own online shop some day too! I like you :) keep up the good work! Thank you for liking my blog. Yours looks like fun, too. Hi, thanks for the “like” on my blog. We have a playful maltese and our floor is slippery to him. When he runs is becomes a hovercraftdoggy. Nice word you made there. Love your stuff here too! Thanks for sharing. Thank you for finding my blog and leading to yours. I look forward to exploring your work. You have great style. Thanks for the inspiration! Your work is always so stimulating — part of the reason that, having just received the So Sweet Blog Award, I am now offering it to you in turn. If you choose to accept, please visit my 1 October post, paste the award into your own post on the subject (and include the URL for my post), and in turn offer the award to one or more other bloggers. Thanks for finding my blog so that I could find yours! Thanks for liking several recent posts. Best to you. Thank you for your Like of my graffiti post. You have a very artistic Blog. Feel free to re-visit. Thanks for stopping by my blog; it’s much appreciated. Thanks for stopping by my blog post about my friend photographer Jane Fulton Alt. Thank you for the like. Great photos you have! I like your Scottie icon too. We have a Westie. Glad you liked my poem, so got the chance to discover you. Am amazed by what you do, pearls for brain, heart, mind, art…. Hey there… I’ve enjoyed your blog and have nominated you for a Beautiful Blogger Award. Tis your choice to accept the award or not. To find out more please visit my post: http://bebebutler.com/2012/10/17/a-thank-you-for-the-beautiful-blogger-award-passing-it-along-now/ and find directions, as well as a list of other bloggers I’ve nominated. Hi. Thanks for taking the time to visit my blog and click on the Like button to my most recent blog post. Your blog is interesting and creative. Keep up the good work you’re doing here. I hope to hear back from you again soon. Cheers! Love what you’re doing… thanks for stopping by the N.G. Studio. How are you guys finding Society6? Very creative and unique blog! It’s nice to meet you. And thanks for visiting carefreecomposition.com! Thanks for stopping by my blog and liking several recent posts. Best to you. Thanks for visiting my blog today and liking “Withdrawn”. I do hope you’ll stop by again soon! You have a fabulous blog here. Very nice! I find this blog very inspiring! Keep it up! Thanks for checking in at my blog! That has lead me to yours which looks quite fascinating! I really like your hoverdog picture! I just started following Hovercraftdoggy recently. Not sure that I’ve made any comments, though I consistently “like” your posts. You have a beautiful blog. It seems to reside in a place all it’s own. The tone and elegance are simply lovely. Along with everything else, the inspiration for your name is great! thank you very much for your kind words chris! :) … we really do appreciate every one of our followers and value your loyalty. We hope we can keep inspiring you for many more days to come! best wishes H.
HI! I do enjoy the way little dogs walk, wish there were many little dogs that could go on several mile runs. Oh, and thanks for stoping by my blog! Look forward to more amazing photographs. Thanks for stopping by and liking “Beauty multiplied”. Thank you for visiting my blog and bringing yours to my attention. Hey guys!!! Love your Blog!!! Thanks for liking my post ;) Happy to meet you!!!! Thanks for stopping by my blog and liking my recent post. Wonderful to see what you are up to. I have nominated your blog for the Blog of the Year 2012 Award. Last night I came home to find that a fellow blogger chose me to be one of his recipients of the 2012 Blog of the Year Award. One of the several blogger-nominate-a-blogger type awards that seem to multiply like rabbits in the blogosphere. Part of the drill is, I get to award a fellow blogger, whose blog I enjoy. Well, tag. You’re it. It will be in virtual ‘print’ tomorrow, on my 365 blog, here on WordPress. I hope you’re ok with it. Tom & Kat you both have a great eye. I love your shared blog. Thanks for checking out my blog folks – I’ve been following you for a while and always enjoy the variety of cool images you post. Glad you are liking some of the stories I’m sharing! Thanks for following our blog. From the bears at TheBigForest. Keep on doing this great blog! thank you very very much :) hope we can keep inspiring you for many days to come! I am sure you will! I just love it! What a beautiful story. Sounds like fun! Thanks for following my blog. I always enjoy your posts. They are refreshing. And thank you for following! This is awkward as I’m not used to spamming, but I just gave you an ‘inspiring blogger award’. You don’t need to go through the steps I described. I just wanted to let you know ;) You can read why I gave it on the link below. Thanks for the like on my latest “View From The Conservatory” post. It was the silhouette of a scotty that got me. But I stayed for all the other good stuff. Keep up the good work! Great account, Hover! really, you have a series of amazing blogs but I’m only read and follow your travels posts because I’m Indian travel agent. thanks for sharing your intelligence. Hi hovercraftdoogy! I realise you must be very busy (judging by all these comments & the amount of content you have on here!) but I found your blog because it was featured on the wordpress columnist theme which I also have – except yours is way more advanced than mine. I was just wondering if you could help an amateur blogger out and tell me how you managed to get your social media icons at the top, and how you were able to list articles under each menu heading? Any advice would be great! Thank you! Ahh thank you – but with regards to the icon, when I click on the link you gave it just displays the icons on a blank web page? Sorry I am not very good at all the technical stuff! Awesome blog by the way. the link shows you the image we have as background picture…the icons are not real if that makes sense.. Okay I think I get what you mean! So they’re just images with a hyperlink to your actual social media pages? Thanks so much for replying though! thanks a lot! :) have a nice weekend. Hi, I’d love to be featured on your blog. How do I submit a project? I wanted to let you know that I nominated you for the Versatile Blogger award because I love everything about your blog and I want other people to discover your blog. If you would like to accept it, the link is below and participation is completely voluntary of course . You certainly do have an eye for the wildly beautiful! In 4 years blogging I still think your icon (gravatar) is the best. Happy New Year from England. Inspiring work! You have a beautiful site. Interesting blog, some really kewl images here. Thanks for stopping by an liking my post “Ohio WInter”. Hovercraftdoggy, thank you for the follow on Petals Unfolding. My hope is that my Blog enriches your Life. Hi, Happy New Year! Thank you for coming by. Looking forward to reading about furniture design and discovering your fashion taste. Thank you for visiting my blog. Best wishes and blessings for the new year! I heard of you on Pinterest & am so excited by finding your blog! This year I am doing a daily blog together with a365 photo challenge I order to help me work through some significant personal upheaval (covered in my blog if you’ve an interest); I think that I’ve found a great site here for inspiration! Super excited to have found you! Happy 2014!! thanks for stopping by and the like on my recent post. You have some interesting posts on your site. I enjoyed looking through them. Best Wishes! Thank you :) best wishes to you too! Hello! Thanks for stopping by! I like what I see here a lot! Will be stopping by more often! Have a good day ahead! Regards! These are fascinating posts. I very much like the way you are featuring diverse and interesting artists. Have got to follow this one! Thanks for stopping by my blog and the like on my most recent post. Thanks for the like on my poem. Great luck with your architecture! Your story sounds like a joke So an Athenian and a Berliner walk into a bar….lol. Good luck with all of your endeavors! H, thanks for the like on my blog. As a real doggy person, your blog´s name caught my interest immediately…and here I am enjoying your great blog, I´ll sure come back for more, it´s fun here ;-) Have a great weekend. very cool concept. architecture is a wonderful way in understanding very human relationships and how we interact with one another. Thank you for liking my quote and photo post! Your photos are so amazing, I’m following your posts! Hello, very nice blog and that futurism work by Balla is great, keep up the great work! Regards. Thanks for visiting my blog and liking it – you have some really interesting images and ideas here! Thanks for following my blog. You also got a new fan. Keep going! thank you! :) .. have a nice weekend.. Thanks for liking my Gothic window doodle! Thank you for liking my photography and for bringing me to your site. I love you blog and will visit it often! Wow. There’s so many beautiful photos on here I don’t know where to start. Thanks for bringing me to your site. Thanks for the like :D and now I can view your ace blog. I am pretty new to WordPress.com, tips and hints would be ace and plz stay tuned to mine as I will be adding more stories and updating. Thanks for pointing me in your direction! I especially love the “hover craft doggy” image – I have two dachshunds, so this really made me smile! Thank you for liking my blog at Louie Behogan. I love your photos! Very inspirational, I will be back to enjoy. I really like your pictures. A lot of people focus on one point and get really good at it, but I like how you have pictures of all sorts of things. I think that’s very creative and amazing of you. Thanks for stopping by my blog by the way, I really appreciate it. Thanks for liking my post – I love your work – very inspiring! STUNNING blog. Glad to have found you. Thanks for the Like on my post! Stop by again soon! I love your photographs btw. Amazing work! Thanks for stopping by and reading my haiku. You have a very interesting site and I will be back to see more. Love your blog and wonderful photos. Thanks for visiting my blog, otherwise, I might never have found all the fun things you share here. I think you are my first blog visitor! Thanks :) My neighbour has 2 ‘hovercraft doggys’, and they are very noisy. I won’t hold that against you though! Thank you for liking my blog. And thank you for giving me an opportunity to see yours – it’s wonderful! This looks like a really cool blog! Thank you for Liking my post….you have an interesting blog here that expresses yourself in many ways….keep exploring and sharing….Wishing you Inspiration and Peace along your Journey. Thanks for stopping by my blog. This site is fantastic – what a great collection of images! You have some great photos and interesting stuff here. Lovable! Fantastic result with a great taste and nice selections. Thank you for the like! You have amazing photos! Thank you so much for your like on my recent post. I love your hovercraft doggy image above and learning the reason for the name of your blog. Your images are stunning! I love your photos :) Can’t wait to see more! Hi, thanks for visiting my blog, for the “like” and for your intriguing photography……..blessings……always.. Simply, the best name for a blog…ever. :) You can tell I love dogs. Thanks for liking my post – A Morning in Town. I look forward to following you. Des. I stumbled upon your blog on my ‘You May Like’ list and it immediately caught my attention. Loving the beautiful pictures and the wacky ones as well! Thanks for stopping by at my blog and the like on “until ‘death’ us parts … or a mini-series on worn jeans”. Just became a follower of your blog! Thanks for liking my trolleybus post on First Night History. I’m glad I’ve found you again. Once upon a time I was following you but I suspect an unfollowing occurred courtesy of a WP glitch! Thank you for liking my post! You have so much to look through and it all looks fantastic…I’m eager for my explorations! Thank you so very much for the “like” of my recent guest post, entitled “Paradox of Chartres Cathedral,” at First Night History. As you may know, I am working on a book-blog which can be seen at [one word] theoryofirony.com, then clicking on either the “sample chapter” or “blog” buttons at the top. Now, on Facebook as well. My Rube Goldberg brain asks with an odd, well-caffeinated kind of logic: Why is there an inverse proportion between the size of the print and the importance of the message? Politics. Science. Commerce. Art. Literature. Military. Religion. I call this eccentric thinking the Theory of Irony and if your busy schedule permits, give a read, leave a comment or create a blogroll link. In any event, best of luck with your own endeavor. The doggy does make one smile!! Very cute! I look forward to exploring your blog and thank you for visiting mine too! What a great collection of images! Thanks for stopping by my blog. Sorry for the delay viewing your site…It was worth the wait! All things beautiful = all things wonderful!